When first proposed by the then State Opposition in 2010, the principal aim of the CSELR (CBD and South East Light Rail) was to reduce congestion by adding additional capacity to the Anzac Parade Corridor. Ironically, one of the major criticisms of the line today, in 2017 a full 2 years before it is due to open, is that it will not provide sufficent additional capacity. Instead, the argument goes, a metro line should have been built from the beginning. The recent decision to defer, in effect abandon, a planned light rail line between Parramatta and Olympic Park in favour of a metro line would appear to reinforce this argument. In the case of both light rail lines, it appears that they have been a victim of their own success. Local Councils in Randwick and Parramatta pushed for the construction of light rail to improve transport capacity, often in the belief that this was a realistic improvement to lobby for. These were then taken up by the state government and soon began to appear insufficient. In the case of the CSELR, the project has matured so much that it is effectively too late to cancel and start again as a metro. In the case of the Olympic Park project, the change from light rail to metro was possible, but will push back the introduction of rail to that corridor by many years. If these plans are successful, eventually a metro line from Parramatta to Long Bay will provide heavy rail capacity along both of these corridors. Thus providing heavy rail capacity where light rail was first proposed. This raises a key question: why didn´t this happen from the start? There are two likely answers. One was that the studies into these corridors began with a transport solution (light rail) for a particular corridor first, then tested whether it would be viable (yes) second. They should have identified a congested corridor first, then identified the ideal transport solution(s) second. Another reason for this was the lack of sufficient funding. Heavy rail is much more expensive than light rail. As an imperfect comparison, the cost of the CSELR ($2.1bn) is much less than the estimated cost of a metro from Parramatta to the CBD ($11bn). Indeed, a Parramatta to CBD metro has been little more than lines on a map until NSW privatisations brought in more money than was initially expected. The solution to all of these problems would appear to be simple: let Transport for NSW do its job. Have them identify corridors that need upgrades to transport infrastructure. Then let them decide what the best options are for those corridors, along with the cost for each option. The government of the time can then make decisions based on what they can afford at each moment. The good news is that this already happens. The last Transport Masterplan in 2012 operated in this manner. The problem arises when politicians or interest groups have their special pet projects. It results in deciding on a mode of transport first and then looking for somewhere to build it. This is an answer in search of a question. It´s backwards and temptations to engage in such actions must be rejected by both decision makers and the pubic at large. With an updated 5 yearly transport plan due this year, now is the time to go back to letting Transport for NSW do its job. 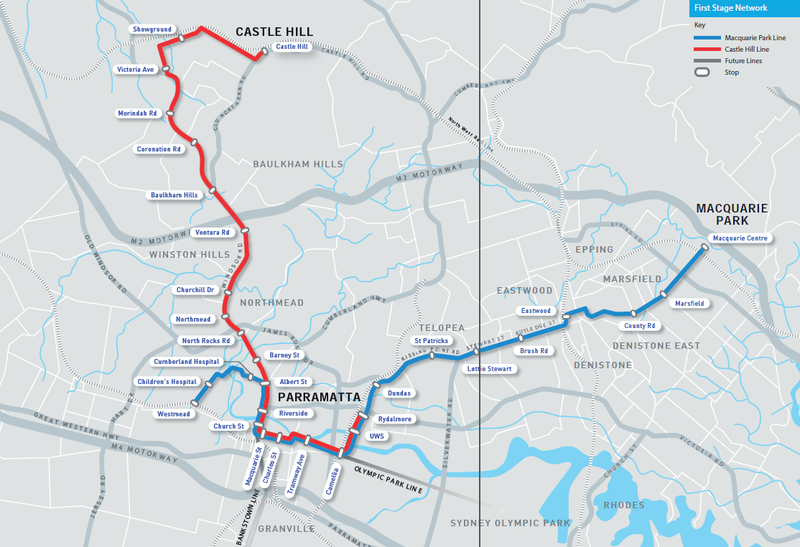 A new light rail line connecting Parramatta and Sydney Olympic Park, running from Westmead to Strathfield, has firmed up as the favourite route to be built by the NSW Government according to a Daily Telegraph report today. 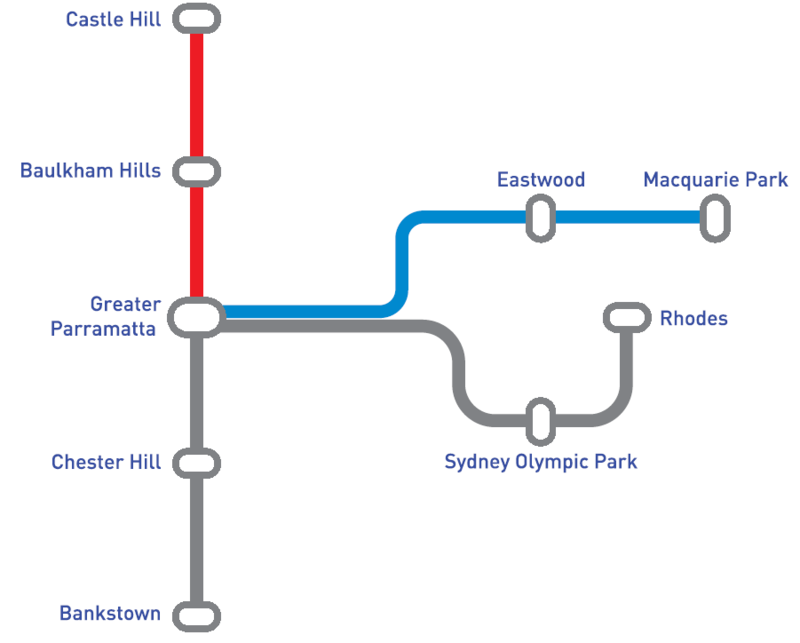 A route from Parramatta to Macquarie Park via Eastwood had been the initial preferred alignment, promoted by Parramatta City Council. However, the NSW Government has opted to consider an alignment via Carlingford and Epping for this route instead. The Olympic Park route received strong support from business groups, which formed the West Line Alliance and offered to part fund the line to the tune $1.1bn in “voluntary planning arrangements”. It also provides the opportunity for urban renewal of the Camellia industrial zone, which West Line Alliance spokesman Christopher Brown claims could provide 21,000 homes over the next 20 years. The Brush Farm Estate was purchased by Gregory Blaxland in 1807, while the Brush Farm House built on the property in 1820 is “one of the most substantial houses surviving from the Macquarie period…[and] represents a nationally important site where some of the colony’s initial land grants were made”. Prior plans for a light rail line through this site involved a viaduct travelling above the property. Last year in 2014, this blog called for light rail from Westmead to Macquarie Park to be built. That view stands. A line from Westmead to Macquarie Park, via Parramatta and Eastwood, takes advantage of existing rail corridors and preserved reservations. It also provides much needed direct connections between growing centres that currently lack them. This was the proposal put forward by Parramatta City Council in 2013. But that option is not on the table. 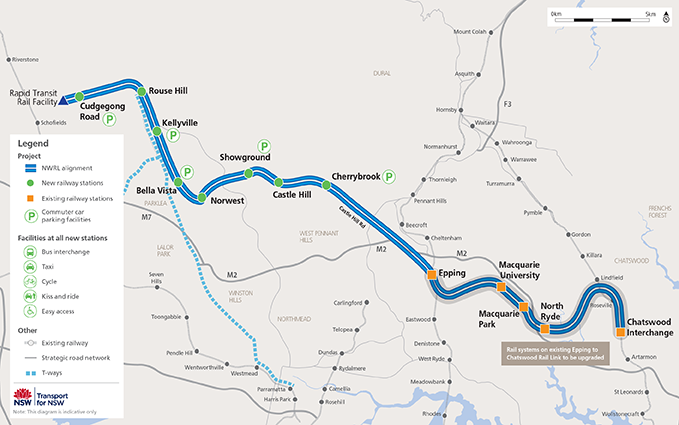 Instead, in 2015 the NSW Government is considering a line to Macquarie Park via Carlingford and Epping. This would require a difficult connection between Carlingford and Epping, currently heavily congested on the surface; it would then either duplicate an existing heavy rail line from Epping to Macquarie Park or terminate at Epping, requiring a transfer to complete the journey. If the choice is between a line to Macquarie Park via Epping or a line to Olympic Park, then the Government’s preferred choice of Olympic Park becomes a lot more convincing. Add in the potential for private sector funding and opportunities for urban renewal, and the case for an Olympic Park line is even harder to argue against. This line will also provide the core of a future network. It will make future extensions to Macquarie Park, Carlingford, Castle Hill, and Bankstown easier. A NSW Labor Government will build all transport projects currently under or about to commence construction plus a second Harbour rail crossing as part of its infrastructure policy released yesterday. It would also drop plans for a 99 year lease of the electricity distribution network, obtaining its $10bn funding by not cutting $5bn worth of business taxes and using $5bn of unallocated funding in the government’s Restart NSW infrastructure fund. Under Labor, projects already under construction, such as the North West Rail Link and CBD and South East Light Rail, would be completed. Projects about to commence construction, such as the M4 East; M5 East duplication; and NorthConnex, would also be completed. In addition, Labor has also committed to the $1bn upgrade to the Western Sydney rail network, which will include improved signalling and longer platforms for trains that are 10 carriages long rather than the existing 8 carriages. The plan would see both WestConnex and a second Harbour rail crossing modified. WestConnex’s M4 East would link up directly to the CBD along a yet undefined path, while the M5 East duplication would be redirected to the airport and seaport at Botany. Meanwhile, the Inner West bypass linking the M4 and M5 would be dropped entirely. Any construction on a second Harbour rail crossing would begin 5 years later than currently planned, in 2022 rather than 2017, and also be subject to a “rigorous cost-benefit analysis and business case”. In addition, no committment was made for a Western Sydney Harbour road tunnel or Western Sydney light rail. Labor’s refusal to consider privatisation, despite being supported by former Labor Premier Morris Iemma and Prime Minister Paul Keating, has limited its ability to promise an infrastructure plan as large as the Coalition’s. The Sydney Morning Herald’s transport reporter Jacob Saulwick put it best when he described it as “less of the same” in comparing it to the Coalition plan. In fact, other than the changes to WestConnex, this is largely a copy of the Coalition plan with some elements dropped and others deferred. One positive to come from this report is an M5 East duplication that links up to Botany rather than St Peters. One of the main benefits of WestConnex will come from taking freight trucks off local roads, and having a direct connection will achieve this while also adding capacity to a growing port. Labor should also be commended on committing to a second Harbour rail crossing. But deferring its construction for 5 years and adding conditions to that construction puts question marks over whether it is serious about building it. Yesterday’s policy document even quotes Nick Greiner, notorious for opposing rail projects and supporting tollroads, to make this case. In doing so, it reveals the real problem with this plan – it shifts priorities away from rail and towards roads. Most disappointing is that this plan makes a clear committment to building a new freeway right into the CBD, while maybe building a new rail line into the CBD at a later point in the future. These are the wrong way around. Roads, which have their place, should provide travel opportunities from low density origins and/or destinations, acting as a bypass of dense areas like the CBD. Rail, on the other hand, works best at transporting large numbers of people from high density origins and/or destinations. So to build a road into the CBD but not rail is highly perverse. 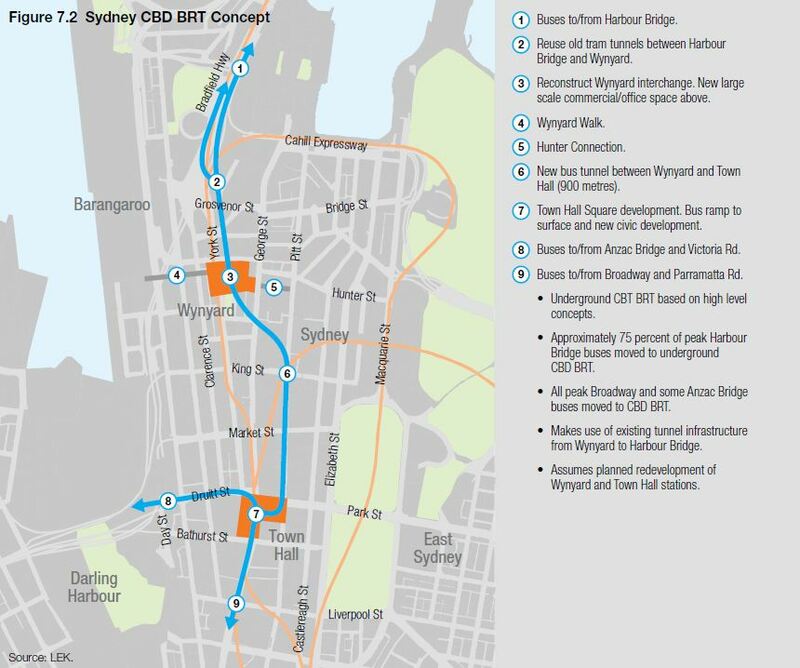 WestConnex and the proposed Western Harbour road tunnel, both of which are plagued with problems like property acquisitions or of inducing demand for car travel, enjoyed the major advantage that they would remove cars from places like the Sydney CBD or Newtown’s congested King St. In the CBD, it would also see roadspace on the surface taken away from cars on George St and Elizabeth St as part of the CBD light rail line as the former is pedestrianised and the latter is converted to a bus road. It is here, and not Labor’s inability to accelerate infrastructure construction due to it committment to maintain public ownership of state owned assets, that is most concerning. Labor prioritised roads rather than rail, and those are the wrong priorities.